Party divisions of United States Congresses have played a central role in the organization and operations of both chambers of the United States Congress—the Senate and the House of Representatives—since its establishment as the bicameral legislature of the Federal government of the United States in 1789. Political parties had not been anticipated when the U.S. Constitution was drafted in 1787, nor did they exist at the time the first Senate elections and House elections occurred in 1788 and 1789. Organized political parties developed in the U.S. in the 1790s, but political factions—from which organized parties evolved—began to appear almost immediately after the 1st Congress convened. Those who supported the Washington administration were referred to as "pro-administration" and would eventually form the Federalist Party, while those in opposition joined the emerging Democratic-Republican Party. The following table lists the party divisions for each United States Congress. Note that numbers in boldface denote the majority party at that particular time while italicized numbers signify a Congress in which the majority party changed intra-term. 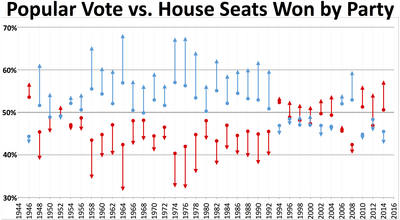 This table shows the number of Congresses in which a party controlled either the House, the Senate, or the presidency. ^ The Anti-Administration Party was not a formal political party but rather a faction opposed to the policies of Treasury Secretary Alexander Hamilton. The faction eventually coalesced into the Democratic-Republican Party. ^ The Pro-Administration Party was not a formal political party but rather a faction supportive of the policies of Treasury Secretary Alexander Hamilton. The faction eventually coalesced into the Federalist Party. ^ Washington disapproved of formal political parties and refused to join either party, though he became a symbol of the Federalist Party. ^ a b The Democratic-Republican Party broke up into two competing parties during the 1820s, but there was no official date of dissolution for the Democratic-Republicans, nor any official founding date of the Democratic Party. In its early years, the Democrats were a faction of Democratic-Republicans who supported Andrew Jackson. The House and Senate websites label this group the "Jackson" faction. ^ a b The National Republicans were formed out of the Democratic-Republicans that opposed Andrew Jackson and supported John Quincy Adams and Henry Clay, but the National Republicans were not a durable political party. This column represents the faction opposed to the policies of Andrew Jackson after the contested election of 1824 but prior to the founding of the Whig Party. The House and Senate websites label this group as the "Adams" or "Anti-Jacksonian" factions. ^ Adams won election as a Democratic-Republican, but he sought re-election as a National Republican. ^ Whig President William Henry Harrison died April 4, 1841, one month into his term, and was succeeded by John Tyler, who served for the remainder of the term. Tyler had been elected as vice president on the Whig ticket, but he became an independent after the Whigs expelled him from the party in 1841. ^ President Taylor died July 9, 1850, about one year and four months into the term, and was succeeded by Millard Fillmore, who served for the remainder of the term. ^ The "Opposition Party" was the Congressional coalition formed by former Whigs and members of the nascent Republican Party. The Opposition Party opposed the Democratic Party in the aftermath of the collapse of the Whig Party. ^ President Lincoln was assassinated and died April 15, 1865, about a month after beginning his second term as president. He was succeeded by Democrat Andrew Johnson, who served the remainder of the term. ^ Johnson was elected as vice president on the National Union ticket, but was a Democrat prior to the 1864 election. ^ Neither party controlled the Senate in the 47th Congress in what's known as the "Great Senate Deadlock of 1881." "The Great Senate Deadlock of 1881". Senate.gov. US Senate. Retrieved 1 July 2014. ^ James A. Garfield died September 23, 1881, roughly six months into his term. He was succeeded by Chester Arthur, who served for the remainder of the term. ^ McKinley died September 14, 1901, about six months into his second term, and was succeeded by Theodore Roosevelt. Roosevelt served for the remainder of the term and was elected president in 1904. ^ The Democratic Party controlled the House in coalition with the Progressive Party and the Socialist Party. The lone Congressional member of the Prohibition Party was not a part of this coalition. ^ President Harding died August 2, 1923, about two years and five months after becoming president, and was succeeded by vice-president Calvin Coolidge. Coolidge served for the remainder of the term and was subsequently elected president in 1924. ^ Roosevelt died April 12, 1945, about three months into his fourth term as president, and was succeeded by Harry S. Truman. Truman served the remainder of the term and was elected president in 1948. ^ Kennedy died November 22, 1963, about two years and ten months into the term, and was succeeded by Lyndon B. Johnson. Johnson served the remainder of the term and was elected president in 1964. ^ Nixon resigned August 9, 1974, about a year and seven months into his second term as president, and was succeeded by Gerald R. Ford, who served for the remainder of the term. ^ The Democratic Party controlled the Senate in the 107th Congress from January 3 to January 20, 2001 (50/50 tie with Vice President Gore as the deciding vote) and from May 24, 2001 to January 3, 2003 (after Senator Jim Jeffords left the Republican Party to become an Independent and caucus with the Democrats). ^ The Republican Party controlled the Senate in the 107th Congress from January 20, 2001 (50/50 tie with Vice President Cheney as the deciding vote) until May 24, 2001, when Senator Jim Jeffords left the Republican Party to become an Independent and caucus with the Democrats. ^ a b c In the 107th Congress (after May 24, 2001), and in the 108th Congress and 109th Congress, Independent Jim Jeffords of Vermont caucused with the Democratic Party. ^ a b In the 110th Congress and 111th Congress, the two independent members of the Senate caucused with the Democratic Party, and thus are considered to be a part of the majority. ^ From January 3 to April 28, 2009, prior to Senator Arlen Specter's switch to the Democratic Party, there were 41 Republican Senators. The Republican caucus returned to 41 on February 4, 2010, with the swearing in of Scott Brown (R-Mass.) to fill the Democratic seat of Edward Kennedy and Paul Kirk. After Mark Kirk (R-Ill.) replaced Roland Burris as Senator from Illinois on November 29, 2010, the Senate in the last month of the 111th Congress stood at 42 Republicans, 56 Democrats and 2 independents. ^ In the 112th Congress, the two independent members of the Senate, Joseph Lieberman, Independent Democrat of Connecticut, and Bernie Sanders, Independent of Vermont caucused with the Democratic Party, and thus are considered to be a part of the majority. ^ a b c d In the 113th, 114th, 115th, and 116th Congresses, the two independent members of the Senate, Bernie Sanders of Vermont, and Angus King of Maine, caucused with the Democratic Party. ^ The Democrats and Republicans shared control of the Senate in the 47th United States Congress. In the middle of the 107th United States Congress, control of the Senate switched from the Republican Party to the Democratic Party. ^ During the 27th Congress, the Whigs expelled the sitting president, John Tyler, from their party. Tyler governed as an independent.